The newest member of our seasonal retail greenhouse line, the Kool-Mart is a budget -friendly structure that features integrated display benching, quick setup and heavy-duty construction. 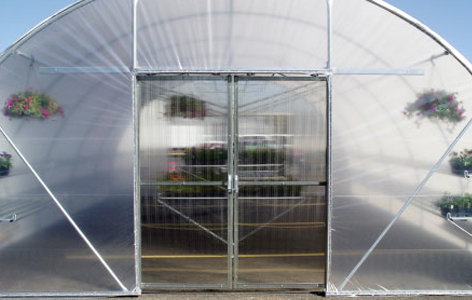 Whether you are just starting out or are an established business looking for an economical seasonal addition to your garden center, the Kool-Mart is the no-nonsense greenhouse for you. 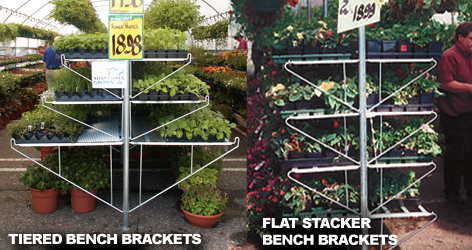 All Kool-Mart greenhouses come with display benching brackets. Display more. Sell more. Restock less. Take off early! 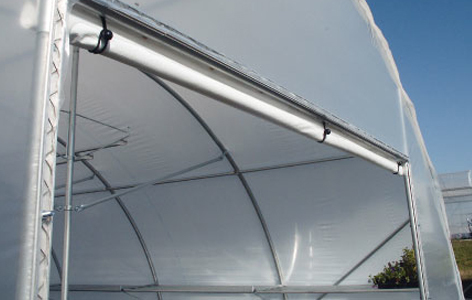 (2) 10' wide x 7' high roll-up doors in your choice of clear or white reinforced polyethylene. These are included with the Base Package and connect with either tiered or flat stacker bench tops from the optional Standard or Expanded Metal Bench Packages. Standard Bench Top Package: Use this package for displaying flats and other items on our bench tops. The Standard Bench Top Package includes the two-tier arrangement roll-form bench tops for the sides of your greenhouse and your choice of either tiered or flat Stacker style roll-form bench tops for the center. Expanded Metal Bench Top Package: This package is great for displaying flats as well as hard goods or smaller items that aren’t in a tray. The Expanded Metal Bench Top Package includes the two-tier arrangement expanded metal bench tops for the sides fo your Garden Mart and your choice of either tiered or flat stacker style expanded metal bench tops for the center. Upgrade from roll-up doors to easy sliding end doors. 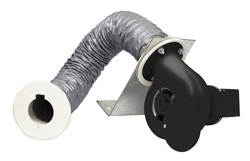 Roll-up side venting offers even greater control over airflow. Yes. In both package prices the bench tops are included. The base price includes just the display benching brackets and allows you to build your own bench tops.All prices also include roll-up doors, single poly roof and end covering, Wiggle Wire poly attachment system, ground spikes and basket purlins. How do I anchor my Kool-Mart ? The included, easy-to-install 18" ground spikes will anchor your Kool-Mart. Inflating two layers of poly film will give you a tighter layer that will flap less in the wind and therefore will last longer. It will also give you a dead air space that will help to insulate the greenhouse. We recommend a double poly roof for anyone in a colder climate. Additionally, in a retail greenhouse such as the Kool-Mart, the inflated roof will look nice and tight and generally give a more finished appearance. How long does it take to set up the Kool-Mart? It depends on the length of the Kool-Mart. Generally it takes 3–4 people 6–8 hours to set up a 48-foot Kool-Mart. Variables such as how the structure is anchored, single or double poly roof and sliding end doors can increase this time.